If you want to open your own Walls of Books® franchise store, take a moment to learn more about our expertise. Visit our Frequently Asked Questions page and contact us at 1-888-94-BOOKS or by using the contact form below. Investing in the Walls of Books® system means that you benefit from years spent refining the art of selling books. This includes our proprietary, well-developed methods of doing business. We have streamlined the process, making bookselling more of a joy than a bother. All these efforts are so that your store has the best possible chance for success. With our history, we are confident that our tools and guidance will create many bookstore entrepreneur success stories! of becoming a Walls of Books® owner? Your store operation succeeds with teamwork. We provide a group of core teachers that will lead you through our extensive training process. 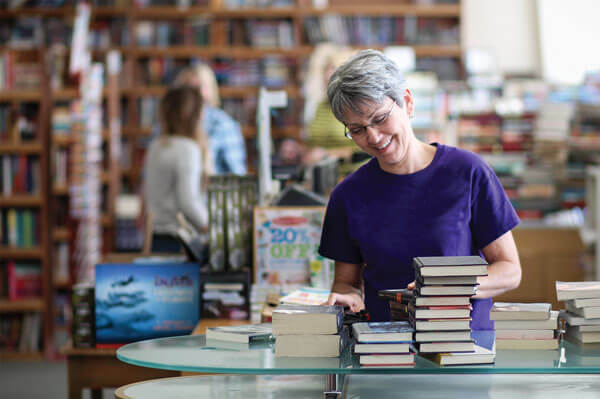 We help you customize a plan to maximize your potential as a bookseller. You will be trained for 3-4 days at the Gottwals Books/Walls of Books® corporate headquarters in Byron, GA. Prior to opening, our team will meet at your store’s location for on-site training and store setup. This process usually takes 4-5 days. After that, you’ll have a fully-functioning used/new bookstore! *This website and the franchise sales information on this site do not constitute an offer to sell a franchise. The offer of a franchise can only be made through the delivery of a Franchise Disclosure Document (FDD). Certain states require that we register the FDD in those states. The communications on this website are not directed by us to the residents of any of those states. Moreover, we will not offer or sell franchises in those states until we have registered the franchise (or obtained an applicable exemption from registration) and delivered the franchise offering circular to the prospective franchisee in compliance with applicable law. Franchises are currently available nationwide with the exception of CA, CT, HA, IL, IN, MD, MI, MN, NY, ND, RI, SD, VA, WA, WI. Registration is currently in process for some of these states. With qualified applicants, we will consider registering in the other states, as well.